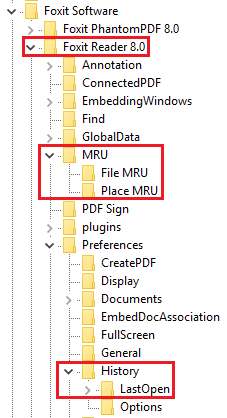 Foxit Reader stores the MRUs under the File MRU and Place MRU subkey in the NTUSER.DAT hive. 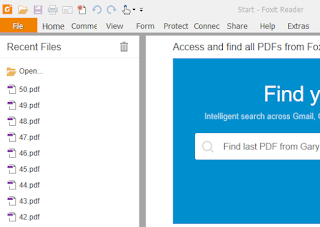 They are named Item1 – Item50 and hold up to 50 of the last PDF file/path opened. Item 1 contains the most recent value while Item 50 is the oldest last. History\LastOpen contains additional details that I'll mention later. 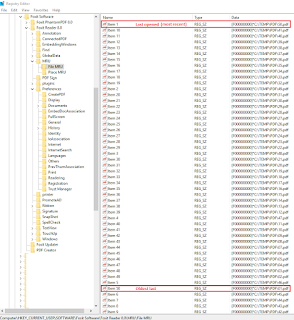 As a test, I opened 50 different files named with numbers: I first opened a file named 01.pdf, then 02.pdf and so on up to 50.pdf. Under History\LastOpen, Foxit Reader stores for each file some important information like the page number of the last page read, the zoom level used and the view mode. As you can notice from the picture below, the page number counter starts at "0". 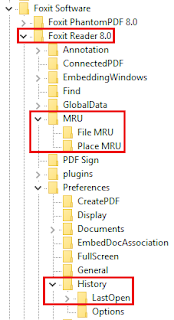 That means that page number "1" in a PDF file is stored as "0" in the registry. My foxitrdr.pl plugin can be downloaded from here. 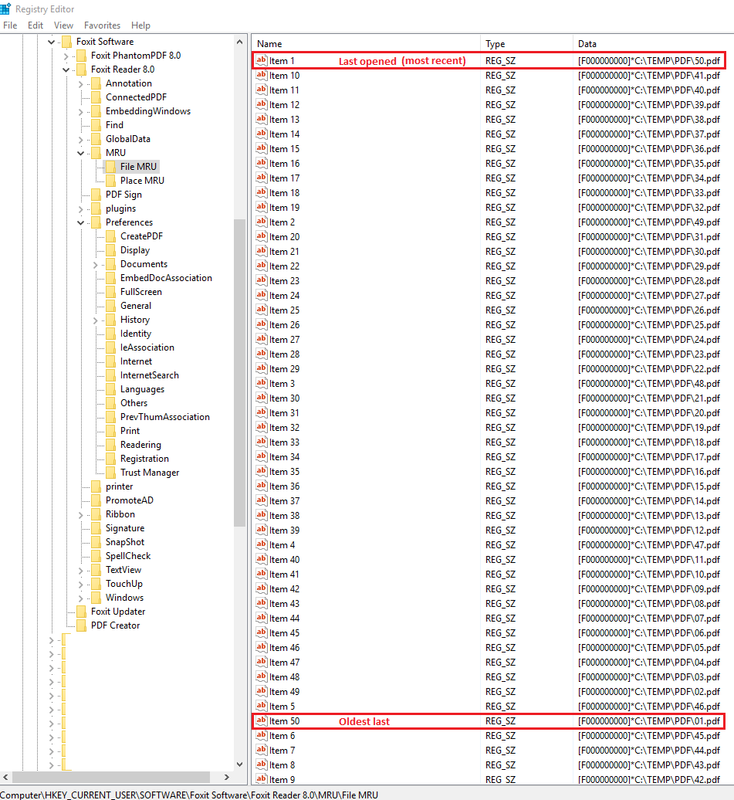 [UPDATE 11/April/2017]: My plugin was added to the official RegRipper repository. Thanks Harlan! I'm not on Twitter, so I didn't see this until someone shared it with me. Would you like me to include it in the distro on the Github site? Yes, please! That would be great. Regarding my plugin, a few days ago I created a pull request through Github. I hope I did it right. I've been using RegRipper for years. It's so good being finally able to contribute a bit to your awesome program.